Richter reissues and discoveries continue to pour in from all sides. 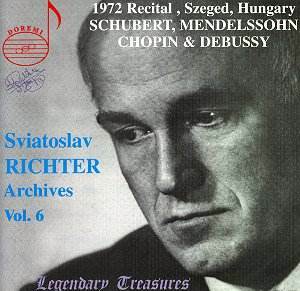 This one proclaims "Richter�s only released recordings ever of Mendelssohn�s Songs without Words, Chopin�s Nocturne no. 1 and Debussy�s Hommage à Haydn", which sounds like a red-letter day for Richterites. Well, "Up to a point, Lord Copper". It�s a strange thing, but I�ve heard dreadful recordings, classic ladies� handbaggers, including some of Richter, where, in spite of the murk, "through a glass, dimly", one was left in no doubt that great and wonderful things were taking place. This one certainly didn�t come from any lady�s handbag. The microphone is oppressively close to the piano in the Schubert and for the rest of the programme seems to have been actually inside it. We have heard recordings in which Richter span a liquid legato, every note a pool of light. Here every note has an aggressive ping, those above mezzoforte suggestive of breaking crockery. If it were not that an audience can occasionally be heard coughing in the far distance, and applauding the pieces, I might have supposed that I was hearing a cheap modern upright recorded in a tiny padded cell of a studio on a small portable recorder. How has this come about? I can think of two ways. In countries where there is no Musician�s Union to keep a beady eye open for untoward recording activity, people even plonk their little cassette recorders right up on the stage without any objection being made (they were still doing this in Italy in the 1980s). If the source was something like this, then maybe Doremi have done miracles to make it sound even as good as it does. However, those little recorders inevitably produce a lot of wow, and the sound here is at least firm and steady. Which makes me look for another solution, and I wonder if this is a perfectly respectable radio broadcast that has been aggressively cleaned up, for the sound is remarkably similar to what you get if you apply a very high level of dehissing and denoising (certainly there is suspiciously little hiss or noise for an analogical recording), consequently squeezing out all the natural ambience together with the other noises, and then try to "correct" the resultant muffled sound by increasing the upper partials and raising the brilliance enhancer. The effect is totally artificial, just as it is here, where Richter actually seems to be playing an electronic piano. If this second explanation is true, then there remains some slight hope that we may one day hear this recital in more palatable sound. And yet, I get the idea that Richter himself was in one of his enigmatically unyielding moods for much of the evening. After all, there are brief patches of delicate playing in the Scherzo of the Schubert, so presumably the microphone would have registered others had they been there. Of course, if you want your Schubert with Viennese charm and schmaltz, you won�t go to Richter in the first place, and there is a granitic purposefulness to the first movement which is impressive, but I don�t see how improved recording could transform his Prokofief toccata-like onslaught on the finale into anything but a devastatingly insensitive demolition of the music. Similarly, there is real Richter magic in the last of the Mendelssohn pieces, the G minor Gondola Song, raising the doubt that the grumpiness of no. 2 is a true picture, and I don�t see how you could define no. 3 (the so-called "Hunting-Song") as other than relentless piano-bashing, and none too accurate either. Thereafter things are much better. The unpleasantness of the fortes (not too numerous, luckily) cannot hide the fact that the Chopin is unfolded with miraculous calm (and remember that we have no other source for Richter playing this) and that the first Image, "Reflets dans l�eau" is wonderfully poised and iridescent at a tempo that would spell disaster for most of us. While we may reasonably prefer other Richter versions of the Images, if our only opportunity to hear him play "Hommage à Haydn" is to be this one, it is more welcome than not. "L�isle joyeuse" is incredibly clear but the ending has, as recorded, a Stravinsky-like brittleness. Fully paid-up Richterites will want this anyway, and will know how to judge it. As an introduction to Richter�s art it is actually dangerous and could well give a quite misleading impression. You have been warned.